Zach Braff from "Scrubs" fame brought this indie classic to the screen in 2004. He wrote, directed and starred in the critically acclaimed film about a man who returns home to New Jersey after a ten-year absence to attend his mothers funeral. Braff plays Andrew Largeman, a struggling actor living in L.A. whose only big part has been playing a retarded quarterback in a cheesy movie. His father is a psychiatrist who has been treating him for most of his life. Prescribing all kinds of meds that have put him into a fog, moving through his life as a sort of emotional zombie. His mother was a paraplegic and how she became that way is the event that has shaped Largeman's life. Upon returning home he meets up with people he knew in high school. Mark, played by Peter Sarsgaard, still lives at home. He digs graves and scams the local hardware store for money. Nothing changes in the old neighborhood. Everybody goes about their business and every once in a while a guy like Andrew Largeman is able to escape and try to make something of his life. Although one guy in the neighborhood did make it big by inventing silent Velcro. Largeman is just as lost and messed up like everyone else. Soon enough everything is about to change. While in a doctor's office waiting room Largeman meets Sam, played by Natalie Portman. An almost too perfect local girl who we find out has epilepsy. 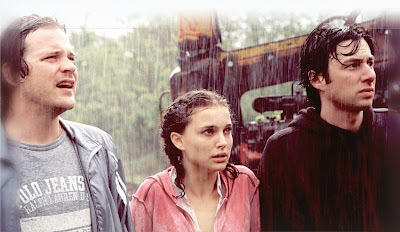 Their relationship builds over the course of the film to a satisfying but somewhat clichéd ending. 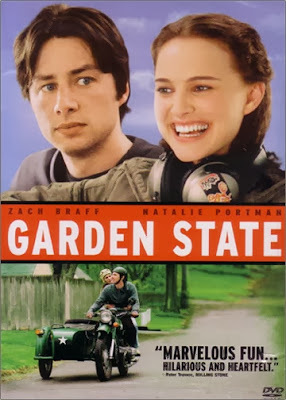 "Garden State" has a great overall feeling to it. The characters a very real and down to earth. They feel like your own friends and are quite relatable. It's the timeless story of one man's journey to find his place in the world and to reconcile his past. It's about Largeman coming to grips with what his dad had put him through as a child and being able to move forward. It is the quintessential indie film with a great soundtrack that on awards in itself. Take the journey with Andrew Largeman and watch "Garden State" tonight!